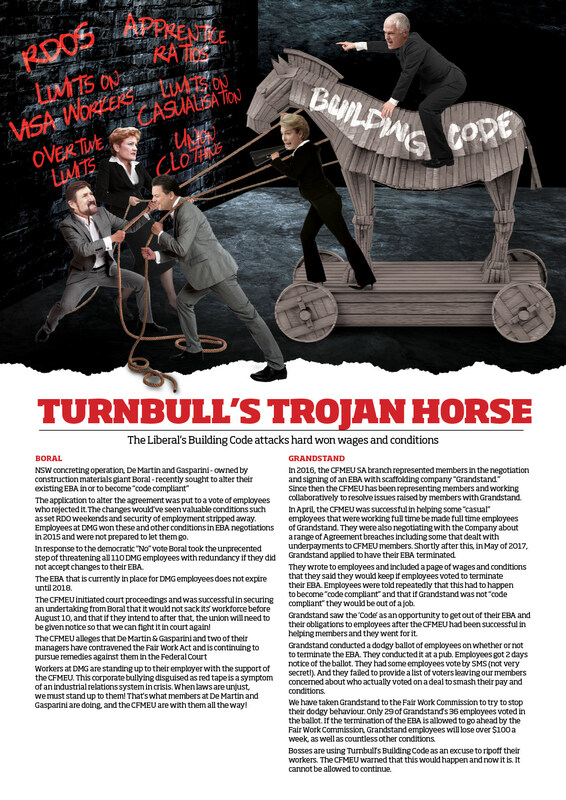 After years of political struggle the Liberals finally managed to pass back into law the Australian Building and Construction Commission, and with it, their Building Code. The Building Code is an extra set of rules that the Builders must adhere to in order to tender for any Government funded construction projects. The new code has the effect of forcing employers who have successfully negotiated an EBA with their employees to renegotiate and remove certain clauses just so that they can be eligible for Government work. Builders whose EBAs included any of the following positive measures would be unable to tender for Government work unless they become “code compliant”. Union representative structures and procedures. Clauses that encourage the hiring of women and older workers. The code is designed to impose sanctions on employers who recognise the union and negotiate with their employees in good faith. The Government is using its buying power to blackmail employers who engage productively with the union. 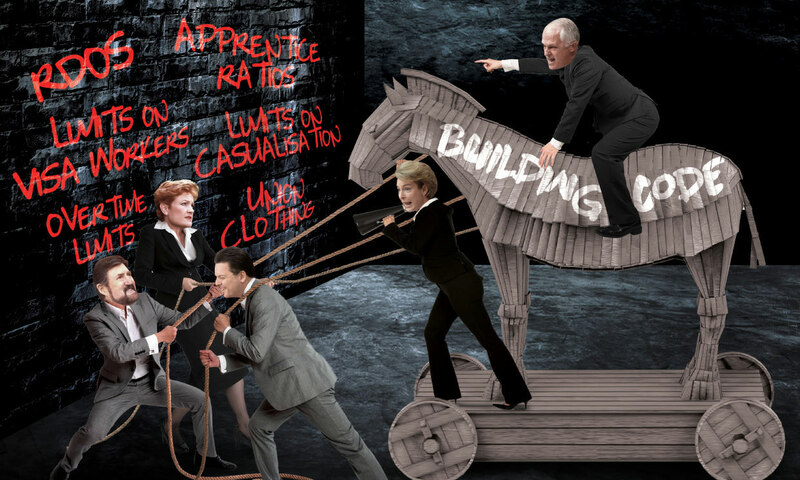 This is union bashing - plain and simple - carried out by blackmailing builders. Before the ABCC was passed, companies in the industry urged the Government to give them long lead time to become compliant so that they could re-negoatiate agreements as they expired, and not pull the rug out from under their employees. Initially the crossbench agreed to this practical request – but in an 11th hour deal with Turnbull and the Liberals, Nick Xenophon, Derryn Hinch and Pauline Hanson decided to change the deadline to September 1 2017. This sent the industry into a spin. Some employers are anxious not to be barred from Government tendering, others are seizing the opportunity to strip back wages and conditions that were agreed to in previous EBAs under the guise of "code compliance"
The Australian Labor Party will propose a “disallowance” motion in August. This will give the crossbench a chance to undo this unfair deal. The CFMEU are working tirelessly towards this goal. In the meantime, some companies are seizing this opportunity to tear up legal EBAs. A campaign of “code compliance” misinformation and fear is spreading through the industry. The most important thing that any union member can do is to be informed and to make sure that your coworkers are too. There have already been examples of companies springing votes on employees with barely any notice in order to terminate or alter EBAs. This has left members confused and scared for their jobs. 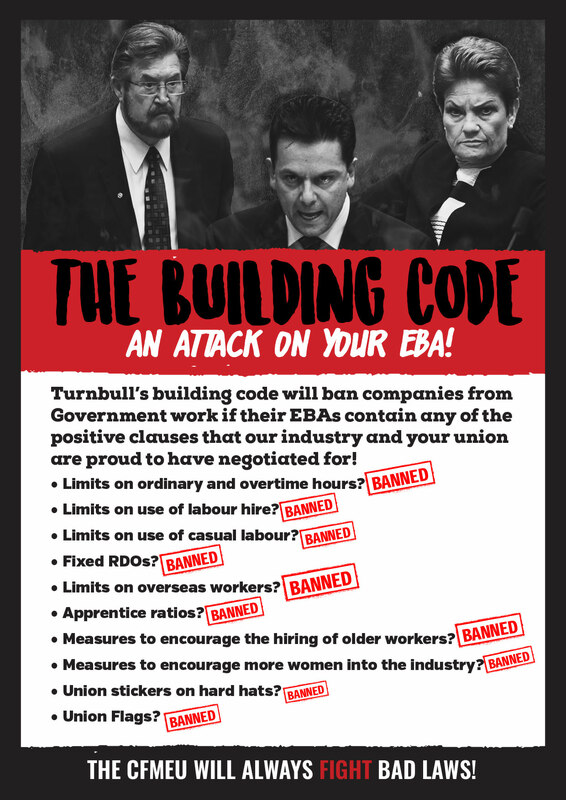 If an employer is talking about “code compliance” and trying to push a vote on an alteration or termination of an EBA – CALL THE CFMEU. Members are being pressured to vote on dodgy agreements and pay-cuts all over the country under the guise of becoming “code compliant” Don’t be fooled. 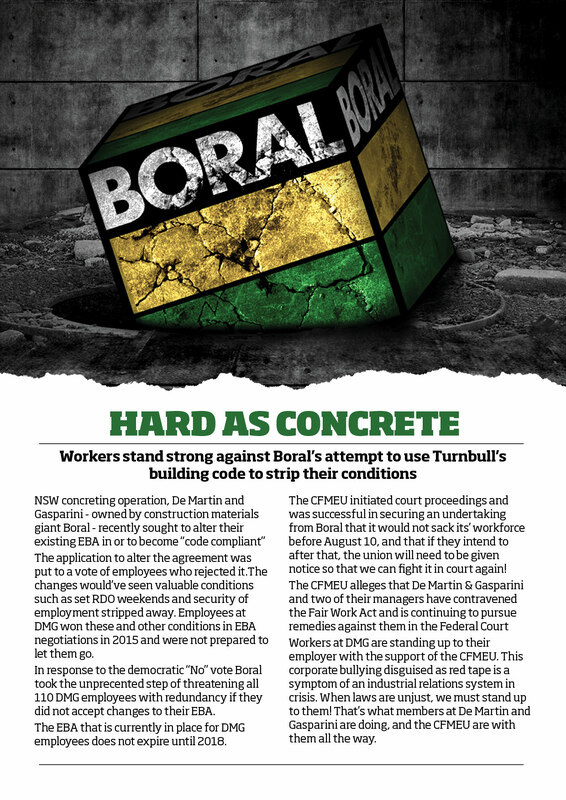 Call the CFMEU to be sure. We can help!